Ketonuria is a condition where ketones are found in a person’s urine. High ketone levels can cause complications and a condition known as ketoacidosis. Ketonuria is seen in patients with unmanaged diabetes. It can also occur during starvation, fasting or dieting. Ketonuria is a medical condition where high levels of ketone bodies are present in the urine. Ketone bodies occur when cells are broken down for energy. Usually carbohydrates are the main source of energy for the body and small amounts of ketones are produced as a metabolic by-product. These ketone bodies are broken down in the liver and usually high concentrations do not show up in urine. However, during fasting or certain diseases such as type I Diabetes there is glucose shortage in the blood and body resorts to breaking down fats for energy. A high amount of ketones is generated as a metabolic byproduct when fat is the main source of energy. These ketones can buildup in the body and cause further damage. Ketonuria can be a highly dangerous condition if the ketones levels are high. People who have insufficient insulin are more likely to produce ketones. Therefore, people with type 1 diabetes are at higher risk for ketonuria. When the body is producing low amountof insulin, then the body will start preparing for alternate measure for energy.Due to the lack of sufficient insulin to get energy, the body will start breaking down body tissue into ketones, which can be used as fuel in the lack of insulin. The causes and treatmentof ketonuria differ from person to person and the course of treatment depends on the original cause. Here are some of the most common causes of ketonuria. Any condition which causes a reduction in glucose availability in the bloodstream such as diabetes or renal glycosuria can cause accumulation of ketones in blood and consequently ketonuria. In diabetic patients there is not enough insulin to derive energy from glucose and hence body uses alternative sources of energy, producing excess ketones in the process. A low-carbohydrate diet and/or starvation can also cause ketonuria. Long periods of starvation or dieting which focuses on a high fat/protein and low carbohydrate diets do not provide enough glucose to our bodies. Low concentration of available glucose forces the body to break down fat for energy and can cause ketonuria. Frequent urination – As body tries to get rid of excessive ketones in blood, the patient might suffer from an increased urge for urination. Nausea and vomiting –As ketones slowly accumulate in the body, the body excretes a greater amounts of ketones and hence excreting sodium and potassium salts out too. Low levels of sodium and potassium in the blood can cause nausea and vomiting. Dehydration and excessive thirst – Loss of fluids from urination and vomiting can cause dehydration. Heavy breathing – The person having high concentration of ketones in the blood may suffer from deep, heavy and laboured breathing. Confusion and disorientation – This symptom is rare and is caused by harmful effects of ketones on the brain. Fruity smelling breath – One of the ketones, called acetone has a fruity smell and is excreted through lungs. A person having excess ketones in the body might develop this symptom. Treatment of ketonuria depends on the root cause that is causing excess production of ketones in the body. Ketonuria caused due to dieting or starvation can be treated by taking proper balanced diet high in carbohydrates. For diabetic patients who are suffering from Ketonuria, it is vital to take better measures to manage their disease to reduce ketone levels in the bloodstream. Ketonuria can be prevented with proper care. 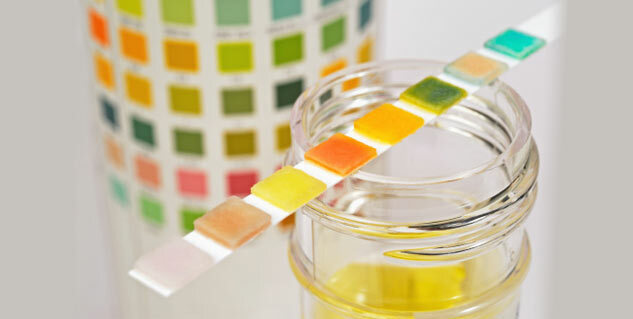 Since diabetic people at higher risk of ketonuria, in order to prevent ketonuria it is required to closely monitor the levels of glucose in the blood and ketone bodies in the urine. Although ketonuria is more common primarily in people with type 1 diabetics, it can also occur in type 2 diabetes patients. Therefore, it is highly recommended that all people with diabetes, especially type 1, closely monitor both their glucose levels as well as ketone levels. Over the counter home tests kits are easily available to check both glucose and ketone levels. While the most crucial step towards managing ketonuria is to regulate the blood sugar and ketone levels, it may not be enough. It is also recommended to make some lifestyle changes in order to better manage ketonuria. One of these most important changes is to avoid ketogenic diet, which is high in fats and low in protein and carbohydrates. The diet mimics starvation and can easily raise the level of ketone bodies in the blood. The diet is quite common and several physicians recommend it because ketone bodies can prevent or decrease the incidence of many types of seizures, including myoclonic and atonic seizures. However, considering the risk of ketonuria the ketogenic diet is very strict and must be closely managed under a physician's supervision. People who have ketonuria should eat a healthy diet which is low in fat, protein and carbohydrates. Fresh fruits and vegetables are more suitable for ketonuria patients.